Product #60627 | SKU BRC-X400 | 0.0 (no ratings yet) Thanks for your rating! A deposit of $200.00 is required for this pre-order. The Sony BRC-X400 IP 4K Pan-Tilt-Zoom Camera with NDI Capability is ideal for cost-efficient content creation, the compact yet powerful camera is extremely well-suited for broadcast applications from studio to reality TV shows as well as shooting in large venues including event halls and houses of worships (HoW). Extending operational and creative possibilities, the BRC-X400 supports IP and is equipped with NDI HX capability with optional license, a first in Sony’s PTZ camera line-up. The NDI|HX option presents unprecedented flexibility in IP-based live production systems, when combined with other NDI-compatible hardware or software, anywhere on the network. Connection via a single IP cable can ensure an efficient live production set-up including power supply, image output as well as camera controls. In addition, Real Time Streaming Protocol (RTSP) and Real Time Messaging Protocol (RTMP) are also supported. The BRC-X400 realises high picture quality effortlessly, thanks to the highly sensitive Exmor R™ CMOS image sensor. The newly developed sensor achieves natural colour reproduction and delivers 4K30p with minimum noise. The built-in high resolution 4K lens accommodates wide-angle shots up to 70 degrees, and is equipped with 30x powerful zoom capability in 4K with Sony’s unique Clear Image Zoom feature. Further enhancing its offering, users can utilise the 80x zoom capability in Full High Definition (FHD) with Tele Convert Mode. In addition, horizontal resolution 1700 TV line (Centre) in 4K and 1000 or higher TV line in FHD (Centre) captures details of the image. Allowing seamless switching during live events and reality shows, the BRC-X400 comes with broadcast-friendly features such as tally lamps and genlock supports. The PTZ camera is equipped with a newly available function – Scene File. This allows users to apply the same operating menu from one camera to others for fast and easy setup. Future-proofed for expansion or upgrades to ensure peace of mind, the latest addition to the BRC series can be integrated into existing broadcast system workflows easily with its vast range of camera control protocols support. This includes 700 Protocol for Sony’s broadcast cameras, CGI as well as VISCA / VISCA over IP. 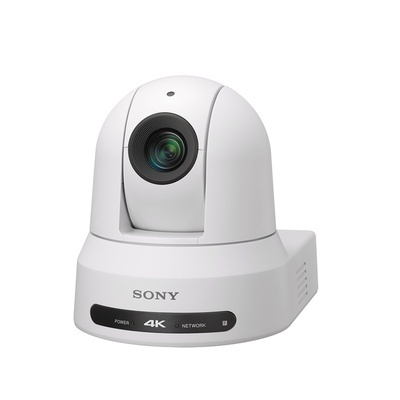 In addition, BRCX400 can be used with Sony’s cutting-edge products such as Sony’s first AI-based video analytic solution, REAC1000. A simple, cost-effective chroma key solution in 4K high picture quality can be achieved using its chroma key-less CG overlay feature to extract the presenter and overlay them onto any background without the need for a dedicated backscreen or specialist training.